You can add posts and custom links to your navigation menu. (Click here if you can’t see this video in your feedreader). 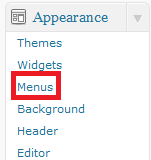 Then, select your new menu name from the “primary navigation” drop-down on the left and begin adding custom links to your new navigation menu. …you’ll title this navigation tab “Featured Listings” and your page will then link to the parameter which displays all of the listings associated with your Agent ID. Hope that helps, and as always, let us know if you have any questions! Can you do slideshows like what Matt did with IDXPress? Does it require the purchase of any other products? If not, where can I find the documentation for how to get it done? Very helpful tutorial for WordPress newbies.